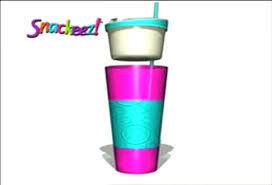 An inconvenient bout of insomnia over the weekend found me watching TV at 4 AM, which is how I discovered the existence of Snackeez, a “Party in a Cup” that allows one to eat and drink out of the same vessel. Clever or gross? You decide. 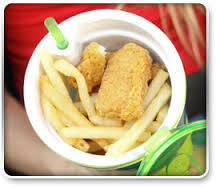 A low point of their commercial is a young girl riding in the backseat of a car, eating chicken nuggets and fries from the top part of the cup and sipping soda from the bottom. Solid vote for the gross camp from me. P.S. This “Snackeez” parody commercial is hilarious.